The saffron under the PDO La Mancha Saffron is a spice obtained by drying the stigmas of the Crocus Sativus, L. whose uniqueness is due to its bond with environmental, human, cultural and historic factors of La Mancha. The Saffron under this Protected Designation of Origin is the only spice that has got this national quality guarantee. The specific requirements for its production and commercialization, as well as the physicochemical and sensory qualities it must fulfill are registered in a document, the Product specification (es), which has been approved by the European Commission. All producers and canners in the marketplace must meet the product specification. An independent and impartial control Agency verifies every year that the agents do fulfill the Product specification. This control Agency has been authorised by the competent authority and validated by ENAC (Spanish National Accreditation Body) by the regulation UNE-EN ISO/IEC 17065 or the one that replaces it. Its aspect must be in the shape of stigmas. It must be always packaged in containers of less than 100 gr. it must be packaged in less than one year after its production. <pPurity, physicochemical and sensory features of La Mancha Saffron are shown in this chart (es). The Conformity Certificate of the Control Board of the PDO La Mancha Saffron constitutes a triple guarantee: highest food security, the highest threshold for colour, scent and flavour, and Spanish origin. There are documental records of inventories of this farming since 1720. Pedro Muñoz, Campo de Criptana, Manzanares, Lillo, Madridejos, Villacañas, Villanueva de Alcardete, Cabezamesada and Motilla del Palancar are municipalities with an ancient tradition of cultivating saffron. The Product specification determines that the production area of the Protected Designation of Origin La Mancha Saffron is the geographical heart of Castilla La Mancha. There are 500 affiliated who produce, prune and dry the saffron and 7 companies devoted to packaging and commercialization inscribed in the Registry of the Board of Trustees Foundation of the Protected Designation of Origin La Mancha Saffron. In 2013, the agricultural surface included in the PDO was about 100 hectares and the estimated production was about 500 kilograms. Besides the geographical condition, and the farming, La Mancha Saffron is an inseparable part of the history and culture of this land. As a proof thereof there are many words related to the production of the spice in the popular lexicon, references in proverbs, sayings and lyrics, public festivals around this farming and anthropological traditions connected to the wish of success. 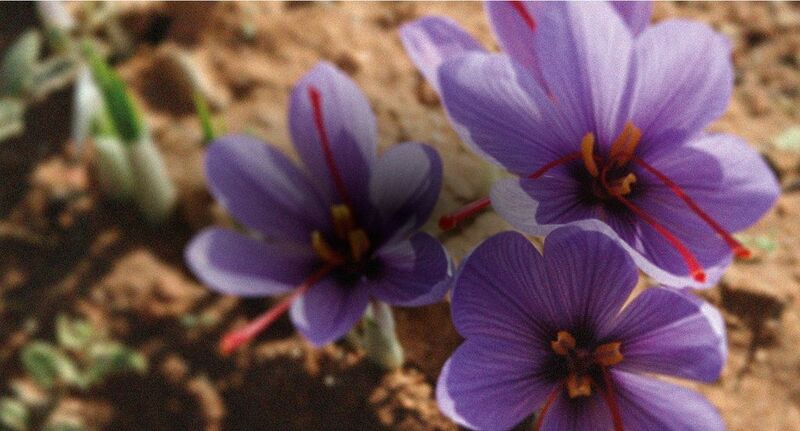 The weather conditions of the production area of the saffron under the PDO La Mancha Saffron make the flowers bloom between the second fortnight of October and the first fortnight of November. Daily, during this period, the flower is harvested, in consecutive rounds in the saffron field. The cut flowers are softly placed, avoiding compression, in containers which allow ventilation, traditionally wicker baskets. Theses containers are kept away from direct sunlight and are immediately taken to the pruning. The harvested flowers undergo a process of pruning - the extraction of the stigmas, which must be done within the following 12 hours to the harvest. Temporarily, and until the flowers are pruned, they are laid, avoiding compression, on a dry and absorbent surface. The process of extracting the stigmas is a manual process which requires expertise. It is done by pinching the style where it is white. As mentioned above, the saffron stigmas under the PDO La Mancha Saffron are presented in the shape of groups of three stigmas, merged to a part of the white style which is shorter than the stigmas. As the stigmas are extracted, they are left in a container until the process of drying. The drying of the saffron under the PDO La Mancha Saffron, as it is established in the Product Specification, is strongly related to the expertise of the skilled workers and the tradition. Dried saffron is quickly stored in containers that keep it away from humidity and light, and at a moderate temperature. The Saffron under the PDO La Mancha Saffron is commercialised exclusively in packages of a maximum of 100 grams, with a sealing system that guarantees its conservation, and it has been produced in the year prior to its packaging. Until it is brought into the market, the saffron is stored at a temperature below 25C. The authorised companies to package the saffron under the PDO La Mancha Saffron have suitable self-control systems, to fulfill the Product specification of the Protected Designation of Origin, and which have been certified by an independent control agency that validates the compliance of the Product specification with regard to the physicochemical and sensory qualities. Every company is audited yearly to verify that the comply with the Product specification. The audit is carried out by an independent and impartial control Agency which has been validated by ENAC (Spanish National Accreditation Body) by the regulation UNE-EN ISO/IEC 17065:2012 and authorised by the Agrifood Department of Castilla La Mancha. The labelling of the saffron under the PDO La Mancha Saffron clearly shows the Community Collective Mark, the data of packing and use-by date, according to the current legislation.